Feeling overwhelmed? Try an outline. 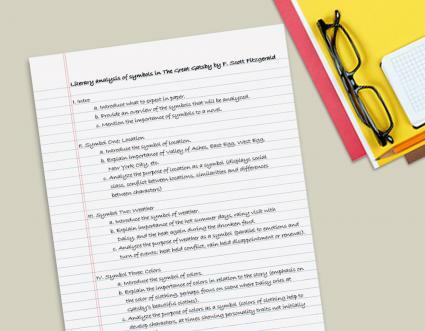 Whether you're writing a one-page essay or a lengthy novel, an outline is an invaluable tool for keeping your writing on-topic and ensuring your piece is comprehensive. The right outline helps you be an efficient, skillful writer. Like so many writing tasks, you can turn the process of writing an outline into a series of steps. This makes a big project easier to accomplish. In order to begin organizing your work, you need to first come up with your main idea. In the case of a nonfiction piece, this will be your thesis or the point you plan to prove in your writing. It should take the form of a single, complete sentence and be as specific as possible. For example, a thesis might read something like this: "In the poem Ozymandius, Percy Bysche Shelley is commenting on mortality and the naive belief in a lasting legacy." In the case of a fiction work, your main idea will be the central conflict of your story. You can write it as a single sentence, naming specific characters and their desires and obstacles. It might go something like this: "When her husband is seriously injured in a construction accident, Sarah must overcome her agoraphobia and find a way to financially and emotionally support her family in the outside world." Either way, this main idea will guide you as you flesh out your outline and eventually begin writing your piece. When you've chosen your main idea, write or type it at the top of a piece of paper. You'll be referring to it often. After you've established your main idea, you need to come up with a list of details that will help make that idea believable to your reader. Think of your piece of writing like a house. Your main idea is the very peak of the house's roof. You'll need lots of ideas to build the foundation for your house, create its walls, and make sure that roof is fully supported. Sit down with your notebook or computer and begin writing ideas. Don't worry about how effective they are or the order in which you'll introduce them. You simply want a list of great details that support the main concept of your piece. After you've written your list, it helps to get a little distance from the piece if possible. This lets your mind rest and allows you to view the list with fresh eyes when it's time to organize. Now look at your list and begin removing any details that don't really support your main idea. You can simply cross them out or copy and paste them to a separate document. When you've edited your list down to the best ideas, it's time to start organizing. Choose the ideas that stand on their own as support for your main idea. You can call these secondary ideas. In a non-fiction work, each of these secondary ideas will represent a paragraph or a chapter. In the case of a fiction piece, they may be turning points in the story. Use a highlighter to mark these as your secondary ideas. Now look at the details that remain on your list. Some of these may be support for your secondary ideas. Use arrows or cut and paste to place these supporting ideas underneath your secondary ideas. Your outline is starting to come together, but there may be details missing. Take a look at how it flows. Do you have enough secondary ideas to support your main idea? Not all of your secondary ideas will need support, but for those that do, are there enough supporting details? When you've identified where you're missing details, add them in. Then take another look at your outline. Is there enough there to take your piece in the direction you have in mind? If not, keep working until you're happy with it. Now that you've got all your ideas written down, it's time to put them together in outline form. For a research paper or other non-fiction piece, your outline will begin with your introduction, where you will clearly state your main idea and give a glimpse of how you plan to prove it. Then you will list your secondary ideas with their supporting details in the order you decided upon. Finally, you'll end with a conclusion, where you will restate your main idea and why it is correct. If you're working on a fiction piece, your approach may be different, depending on how you plan to organize the work. For instance, if you're writing an outline for a novel, you may find that you simply want a list of chapters and what will happen in each one. Organize the outline in any way that's comfortable for you. Main idea: A dog makes a great pet. I. Introduction: State that a dog makes a great pet. II. Dogs are good companions. a. Mention studies about how dogs are related to better health. b. Talk about how dogs can help children with disabilities. a. Describe yearly costs of care for a dog compared to other animals. IV. Dogs can protect their owners. a. Describe an example of a dog protecting its owner. b. Talk about the traits that make dogs good protectors. V. Conclusion: Dogs make great pets. No matter what type of work you're writing, having a plan is a great idea. However, it's also possible to get involved in the piece and realize you need to add sections or move things around. Stay flexible about your outline, but keep the main idea of your work in mind. Ultimately, that needs to come across clearly to your reader, but everything else is malleable.